Clematis, though so different in habit, has a flower of very similar construction. In most cases Clematis is a tail climber, clinging to any available support by means of the leaf stalks. These stalks have the unusual power of bending round any object they may touch. They thus do the work commonly done by tendrils. The leaves of Clematis, unlike those of other genera of the family, are arranged in pairs. There is not a calyx and corolla, but only one circle of petal-like leaves. By common consent, where there is only one such organ, though it may be coloured like a corolla, it is called a calyx, and each element is therefore called a sepal, though it may look like a petal. In both our common species of Clematis these sepals are white, and usually, but not always, four. The stamens are long, and their anthers narrow, ending in acute points. The pistil is formed as it is in Ranunculus, only the styles are long and clothed with long hairs, giving them a feathery appearance. The single ovule, instead of arising from the base of the ovarian chamber, hangs down from the top. It is common to find in flowers of Clematis that one will bear perfect stamens developing pollen, but the carpels are imperfect, and so it does not develop seed, while others bear perfect carpels but rudimentary stamens. Our common bush Clematis is called Clematis aristata, from the aristate or pointed shape of the anthers. 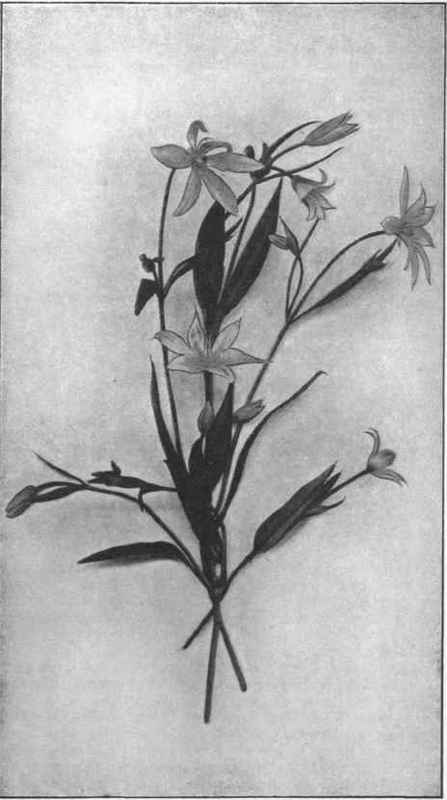 The little creeping oneis called Clematis gentianoides, from its likeness to a Gentian. The Ranunculus family, to which both Buttercup and Clematis belong, is a rather large one, and is well distributed over the face of the earth, but it is poorly represented in Tasmania. 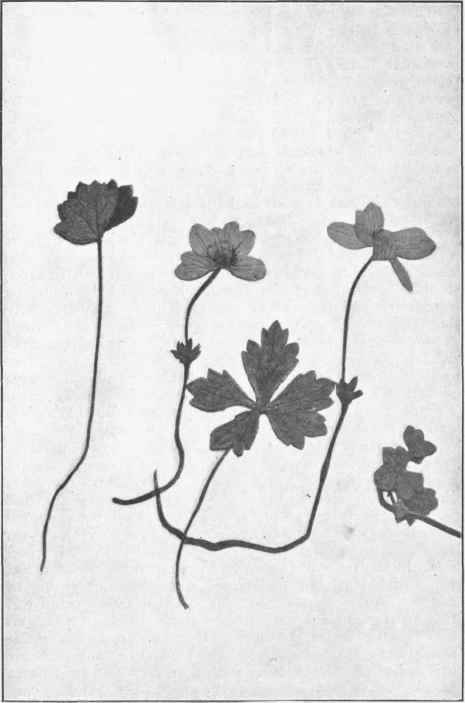 We have a single species each of two other genera, Caltha and Anemone, but they are rare mountain plants, and not likely to be met with by young collectors. As will be seen, the flowers in this family are of a simple type; the portions that go to make up each set of flower elements are arranged spirally above one another on the receptive portion of the stalk. It is an advance in complexity when these are arranged in definite circles. Again, each part is clearly independent of its fellows; for instance, the petals are not united in a tube, as in Heath, nor are the carpels joined to form a complex pistil. For these reasons the type of flower in the Ranunculus family is considered to be a primitive type; that is, a form that was developed early in the evolution of flowers, and from which more complex forms may have been developed. This does not mean that the modified flowers commonly met with were derived from Ranunculus-like flowers in lineal succession, but that they were derived from ancestors showing somewhat similar simple structure. Ranunculus flowers seem to have stood still. Environment suited them, and they were quite able to live and pass On descendants without the necessity for change. This tendency to persistence is common to all parts of both animal and vegetable kingdoms. There is usually room for a limited number of unprogressives, but that limit is easily reached; then the struggle destroys the surplus, except favoured individuals, who have some special advantage which, diverging from the type, enables them to maintain themselves. The result is that in both king doms in the present day we find present not only advanced types of beings, but intermixed with them all grades of simpler forms, down to almost the most primitive. Changed conditions exterminate many links. Organisms that would thrive on our earth when it had a dense atmosphere heavily charged with moisture and carbonic acid, when the temperature was never very high, and never at all low, would not exist anywhere with present conditions. No link seems to be more thoroughly obliterated than the early steps in the formation of living bodies. It must not be concluded from anything said above that all apparently simple flowers are primitive. In the evolution of flowers two processes have been constantly at work, ever changing and obscuring things. There has been a constant advance in many different lines of descent, from the simple to the complex. At the same time, in all sorts of different genera and families reduction processes have taken place that have tended to reduce flowers from a complex to an apparently simple type. Both the advance and reduction are results which we are obliged for the present to refer to as changes induced in response to changes of environment. These two processes of advance and reduction have not taken place in progressive series, but have constantly oscillated in response to ever-changing conditions. The result is that it is no easy matter to unravel the line of descent of any form. We are constantly grouping together beings whose structure appears to denote a like descent, and very often erroneously. 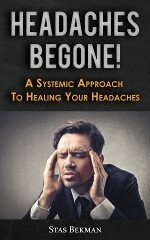 There is always one conservative feature tending to restrain, and that is the possible response the being can make. Every individual plant of one species differs from its fellows. It has its own constitution, with its own limited range of response, and no change of surroundings can cause it to respond in excess of that range. If such is necessary, the • only response left to such an individual is to die. The habits observed in this family, namely, short-lived herbs and long-lived climbers, show that habit is no test of relationship. Some families consist wholly of shrubs, others of trees, while others may contain all conditions. Neither must the shape of the leaves be relied upon. These organs are developed for a special purpose, namely, to increase the extent of green surface exposed to sunlight, and are variously formed according to the possibilities of the plants and the surroundings in which it may find itself. The same shaped leaf may be found in different families, or many shapes in the one. On the other hand, in some cases the leaf may be constant in general features and be indicative of a particular group. The development of leafy structures is of great advantage, and may arise in any plant, whether seaweed, moss, or higher plant, without indicating descent one from the other. It is only an indication that an advantage may arise and be transmitted in any cycle of affinity.